Ativan(®) (lorazepam) is a benzodiazepine which can be used as an alternative to Valium(®). Like Valium this medicine is helpful in the treatment of seizures, but can also provide general relief from anxiety and phobias. This drug does not put as much strain on the liver as most other common benzodiazepines and could potentially have longer lasting anticonvulsant effects when compared to diazepam, though some studies suggest the difference in the duration of effect is negligible. 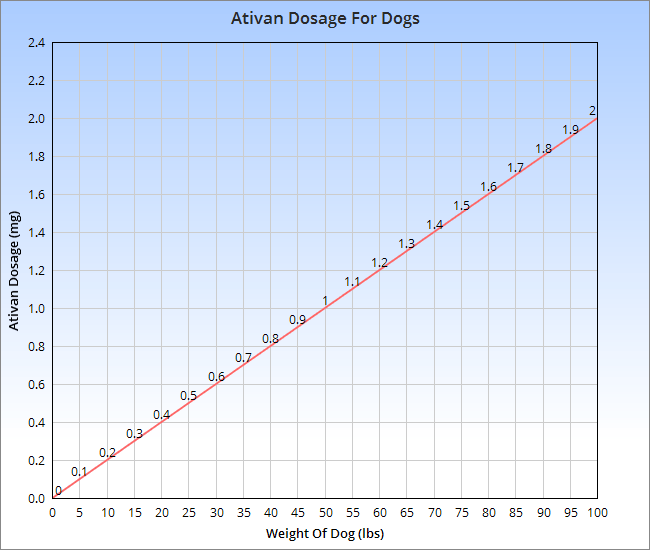 Ativan is probably the better choice for dogs with liver impairment, but it is not used as often as Valium in veterinary practice. To learn more about Valium please see . Note: This drug is available by prescription only. Do not use without the approval of your vet. For relieving anxiety and phobias Ativan pills can be administered at a dosage of 0.01 – 0.045 mg/lb up to three times daily as needed. If you have difficulties getting your dog to swallow the pills, you may place one inside their cheek and give a small treat a minute later. A typical dosage of 0.02 mg/lb is shown on the chart below. When administered as a Valium alternative for the treatment of status epilepticus (a seizure or cluster of seizures lasting for 30 minutes or more) a dosage of 0.09 mg/lb (0.2 mg/kg) should be administered once. The medicine should be delivered by a vet intranasally or via IV/IM injection. The drug should not be injected into arteries due to the risk of necrosis. Example: A 20 lb dog could be given 0.5 mg up to three times a day for treating anxiety, or 1.8 mg once for status epilepticus. Lorazepam is quite safe, and because it does not put as much strain on the liver it may be safer than most other benzodiazepines. Many of the adverse effects are mild unless large overdoses are administered. Lorazepam might not be safe for dogs with severely impaired respiratory function unless respiration is being assisted mechanically. Pregnancy/nursing: This medicine is likely to be safe for use in pregnant and nursing dogs unless the dosage is unusually high. However there is some evidence of fetal risk and based on human use of the drug hypotonia is possible if the drug is used in high doses just before delivery. We recommend discussing this matter with your vet if your dog is pregnant or nursing. After prolonged use of the medicine your dog could experience symptoms of withdrawal if treatment is stopped abruptly. Your vet will be able to help you wean your dog off slowly. According to some sources the difference between diazepam and lorazepam when it comes to the duration of anticonvulsant effects is insignificant. Lethargy and loss of coordination occurs mostly at the start of treatment or when the dosage is increased. Liver damage is not expected with use of the drug but you should still look out for vomiting, yellowing of the eyes/mucous membranes and a loss of appetite. Contact your vet if you notice any of these symptoms or if any other serious side effects occur. Overdoses of lorazepam will not usually result in effects beyond CNS depression, but very large overdoses could be dangerous and result in coma, seizures and even death if untreated. If your dog has been given an overdose of this medicine contact your vet or the ASPCA Pet Poison Helpline (800-213-6680) immediately.